The cold blue water, pierced with the rays of sun that squeeze the opening in the green leaves that protect the entrance to the Tz’onot, begins to come to life with ever dance that the swallows do as they defend their nests from intruders. The long-twisted roost stemming from the trees on the ground above stretch and reach to graze the surface of the water. The small catfish come out from the shadows looking like 5-inch-long sharks only to seek refuge under the thirsty roots of the trees above. The Cenote comes to life, and in the background, the bats hang from the ceiling only moving when they are disturbed. A certain silence permeates throughout the cenote with nothing but the song of the swallows and chirpings from the bats in the distance. With every step in the wet rock I feel the coolness of the water creeping on me. 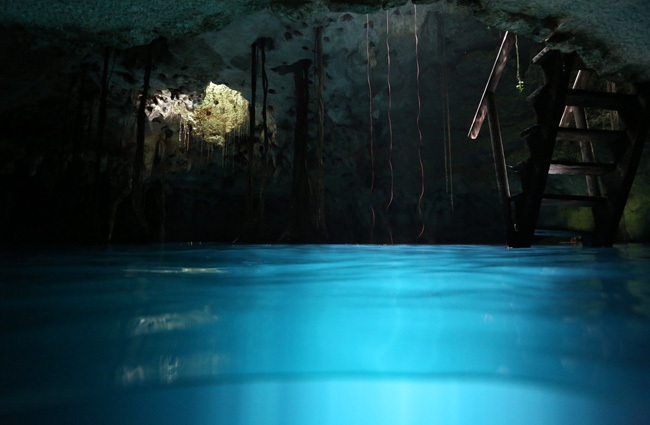 I slowly make my way into the water, and I feel the refreshing water engulf me in the electric blue of the cenote. I can’t help but think I am somehow disturbing the peace, and as I dive down on nothing but a single breath, a particular nirvana takes over. I look down, and I see nothing but blue and darkness only interrupted be the few sun rays that peak through the opening above. I look up, and I see nothing but a hole the light shining through the vent in the roof that his guarded by the green foliage that surrounds it. As I blow air and become engulfed by my own bubbles, I close my eyes and let my mind wonder in the seconds it takes me to reach the surface. I am transported to an age when the cenotes were still a big unknown. When the Maya held them to be sacred places when they were seen as, access points to the netherworlds. I feel the bubbles against my skin and the once cold water is nothing more than refreshing. I reach the surface, and with a big breath, I go back down looking at the darkness of the seemingly never-ending cavern. Again, I close my eyes and blow bubbles. Again, I can’t help but agree with the Maya, and respect the Cenote as a sacred location. A warm sun ray shines on my arm, and the refreshing water engulfs me. The silence of being under water is deafening. I float to the surface, slowly and in a complete sense of nirvana as my head breaks the surface, in the distance I hear the singing of the swallows. I hear the bats as they hang from the roofs over the catfish that slowly have made their way back into the shadows. As I make my way back to the ledge I look over to the cenote as all the life that came to light has slowly gone back into the shadows, the once full of life cenote is no more. And in the peace of the cenote, it becomes easy to see why the Maya’s regard Tz’onot as a sacred place. Time and time again we find ourselves in the middle of experiences and journeys that we feel the need to share with the world. The sacred Tz’onot is one of those that seem almost like a selfish deed to keep to ourselves.